If we were not flower lovers we would have missed Shelburne Falls. We were driving through the Berkshires on #2 Highway in northern Massachusetts when we saw the signage - "Bridge of Flowers." This intrigued us enough that we turned off the highway and made our way down into the little village that subsequently captured our hearts. 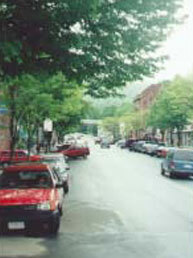 The area known as Shelburne Falls is located along the Mohawk Trail, in Franklin County, Massachusetts. It is actually two small villages on opposite sides of the Deerfield River - Shelburne and Buckland - that are linked by a vehicular bridge and the "Bridge of Flowers." Arriving in Shelburne is akin to driving back in time. We could not believe what we were seeing. The main street is a magnificent time capsule wrapped in nineteenth century architecture. The vista across the river toward Aubuchon=s Hardware and McCusker's Market in Buckland is to look again back in time. As you do not want to miss anything about this area, your first stop should be at the Village Information Center, staffed by knowledgeable volunteers. It is conveniently located in a heritage building on the bustling main street. Armed with pamphlets we decided some reading was in order before we ventured forth. Appealing signage pointed toward the "Bridge of Flowers", Salmon Falls and the Potholes but the street itself beckoned, especially when we saw "10 Bridge Street", a restaurant so reminiscent of the 1940's that we decided lunch was in order. With its booths, slow moving ceiling fans, 40's decor, tin ceilings and huge stack of reading material, "10 Bridge Street" captures time beautifully. Add great reasonably priced specials and friendly staff and you have a winning combination. Appetites appeased, we walked a half a block to the internationally known "Bridge of Flowers". In 1929, the four-hundred-foot-long, c1908 trolley bridge across the Deerfield River was transformed into a botanical feast for the eyes. The iron bridge that could have become an eyesore, is now one of the most spectacular visitor attractions in the Berkshires. The soil on the bridge ranges from nine feet to two and one half feet in depth, allowing more than five hundred varieties of perennial and annual flowers, plants and vine, including wisteria, roses and rare lilies to thrive. Because of the variety of flowers, blossom is enjoyed from early spring through the first frosts of autumn. A rose garden is located at one end of the bridge, along with a donation box and guest book that visitors are encouraged to sign. Shelburne Falls Women's Club is responsible for the volunteer work that goes into this marvellous salute to heritage and gardening. The endeavour is entirely financed through public and private donation, memorial gifts and bequest. 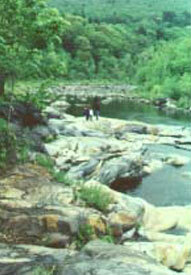 Next stop is a short jaunt to experience Salmon Falls and the Glacial Potholes. Follow the signage. It is an easy walk and an incredible sight. The first thing that strikes visitors is the colour of the rock below the Falls. Granite, worn smooth by a few hundred million years of water flow, gleams with beige, browns, yellows, reds, greys, blacks, greens and white. The famous potholes, both shallow and deep, are caused when a small rock becomes trapped, and through water action wears a circular hole in its captor, a larger rock. The potholes below Salmon Falls range from six inches to more than thirty-nine feet in diameter. 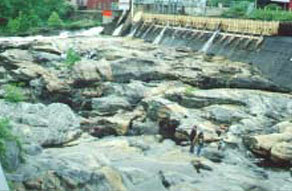 As a matter of fact, Shelburne Falls is home to the largest pothole in the world. 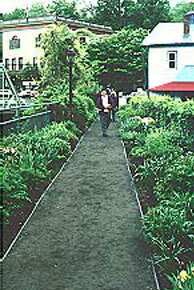 Steps lead down to the riverbed, so that the potholes can be more closely examined. Be forewarned that the area is slippery and can be dangerous. Signs warn that when the horn is sounded people have to get off the granite quickly and out of the gorge. Looking up at Salmon Falls and the dams that hold back the waters, one can imagine what the area must be like when flooding occurs. Don't forget your cameras. The river, dams and potholes are spectacular. All that climbing is sure to make one hungry again so a stop at the Baker Pharmacy on Bridge Street is a must. Once again, you will be transported back in time as you sit at the c1930's Soda Fountain devouring a Tin Roof Sundae. A tour of the main area reveals a number of delightful surprises. Unique and tasteful art studios and galleries, staffed by resident potters and glassblowers, are tucked in with those businesses that are necessary for a functioning, healthy community. One of the most unusual speciality shops is "Wandering Moon", a medieval emporium with clever interior decoration that includes a castle. Check out "Salmon Falls Artisans", AShelburne Artisans Co-operative, "Mole Hollow Candles Ltd." and "Art Inside". Shelburne Falls is equally proud of its "painted ladies", grand Victorian era homes that have been lovingly restored. A walk on both sides of the river reveals architectural gems. Shelburne Historical Society maintains a museum at 33 Severance Street, which is worth a look-see too. 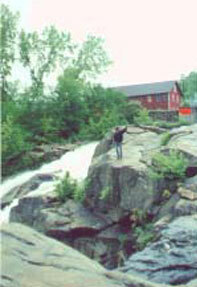 Hiking trails surround Shelburne Falls. For the ultimate hike, try the eight-mile Mohawk-Mohican Trail, which can be easily accessed in the village. Gardner Falls Picnic Area is an easy, level hike. Wilcox Hill is a primitive area that gives river access. Massamet Tower is a short, steep climb but views from the top are spectacular. High Ledges is an easy walk and gives good views over the river valley. A map is available at the Village Information Center for serious hikers. Ask about various backroads jaunts too, past "Johnny Appleseed" farms and comedian Bill Cosby's home. Area accommodation includes a number of bed and breakfast establishments. For a complete list of amenities and a calendar of events, you should contact the Visitor Information Center and Franklin County Visitor Information Center because you will want to spend a few days exploring Highway #2, the Mohawk Trail and charming area villages. Shelburne Falls is fortunate that through a few million years of geological evolution, it has been given a priceless natural wonder to accentuate the built heritage. Area residents are dedicated to preserving visual streetscapes and architectural delights, along with the simplicity and purity of an earlier era. Visitors should go soon, before it becomes so well known that quality might be compromised for quantity.